« What makes an Ideal Indian Policeman ? SANTIAGO (Chile): A Chilean judge ordered former Peruvian President Alberto Fujimori back under house arrest on Friday, a day after a prosecutor recommended his extradition to face charges of human rights abuses and corruption in his home country. The ruling was a response to a request from Peru, which warned that Fujimori is a flight risk because of “the seriousness of the charges” against him, according to the press office of Chile’s Supreme Court. 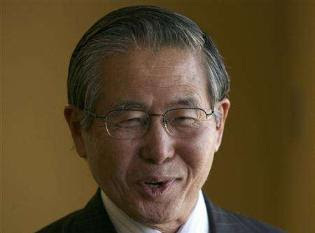 Fujimori spent five years in exile in Japan after fleeing Peru as his decade-long government collapsed under a corruption scandal. But he flew to Chile on Nov. 6, 2005, as part of an apparent bid to launch a political comeback in neighboring Peru. Upon arriving in Chile, however, he was placed under house arrest and held for six months. He was freed last year on the condition he not leave Chile. Judge Urbano Marin’s order that Fujimori be once again placed under house arrest was expected to take effect later Friday. The court was notifying Fujimori of the ruling. On Thursday, a Supreme Court prosecutor issued a report that recommended the former Peruvian leader be extradited to his homeland to face the charges. The nonbinding recommendation must still be ruled on by the judge, a process that could take several months. But a lawyer representing Peru in Chile warned the report might cause Fujimori to try to flee Chile. Fujimori has maintained his innocence and denies he is a flight risk. This entry was posted on June 11, 2007 at 5:46 am and is filed under Peru. You can follow any responses to this entry through the RSS 2.0 feed. You can leave a response, or trackback from your own site.